Larry Summers (b. Lawrence Henry Summers, November 30, 1954) is an American professor and economist. Summers is best known as the United States Secretary of the Treasury under President Bill Clinton from 1999 to 2001. He was also the Director of the United States National Economic Council under President Barack Obama. From 2001 to 2006, he served as the President of Harvard University. Born in New Haven, Connecticut, Larry Summers is the son of Robert and Anita, who were both economists and professors. Summers grew up in Penn Valley, a suburb of Philadelphia. At the age of 16, he began studies at the Massachusetts Institute of Technology. He originally majored in physics, but then changed to economics. Summers matriculated at Harvard University, where he received his Ph.D. in 1982. Summers has two twin daughters and a son with his first wife, Victoria (Perry). Summers remarried in 2005 to Elisa New. New had three daughters from a prior marriage. Summers is the nephew of Paul Samuelson and Kenneth Arrow, both of whom were awarded the Nobel laureates in the field of economics. In 1983, Larry Summers became a tenured professor of Harvard University. He currently serves as the Charles W. Eliot University Professor at Harvard University’s Kennedy School of Government. Summers was recognized by the National Science Foundation as recipient of the Alan T. Waterman Award in 1987. The award was established by U.S. Congress to honor a young American engineer or scientist who has achieved significant results in his or her field. Summers was honored in 1993 with the John Bates Clerk Medal, which is awarded every two years to a notable American economist under 40. Larry Summers took an extended leave from Harvard University in 1991, where he had been serving as the Nathaniel Ropes Professor of Political Economy. At that time, he returned to Washington D.C. and accepted the position of Chief Economist and Vice President of Development Economics of the World Bank. Summers was selected as the Undersecretary of the Treasury for International Affairs in 1993. He assisted Secretary Lloyd M. Bentsen in developing international economic policies. Summers was promoted to Deputy Secretary of the Treasury in 1995. He played a pivotal role in a vast array of financial, economic and tax issues, both domestic and international. 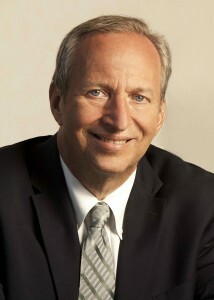 Larry Summers was presented with the John Bates Clark Medal in 1993 for his achievements in the field of economics. Larry Summers acts as one of the co-chairs for the 2006 World Economic Forum. Summers was elected as a member of the National Academy of Sciences in 2002. The organization of engineers and scientists is dedicated to advancing science for the benefit of society. Larry Summers writes regularly for publications such as the Washington Post, the Financial Times and Reuters. Summers is also a commentator on BBC, CNBC, NPR, CNN and the Charlie Rose show. Summers is a board member of Teach for America, Broad Foundation, Center on Global Development, Center for American Progress, Lending Club, Square, ONE and the Institute for International Economics.